Do the Falls actually freeze? Well, technically no. Though it is a trick question, to the eye it might look as though they do. During particularly cold temperatures, the mist and spray begin to form a crust of ice over top of the rushing water, making it appear as though the Falls have in fact stopped. However, the water continues to flow underneath the sheets of ice. With each winter that brings a majority of days with temperatures below zero, the phenomenon known as the ice bridge usually forms. 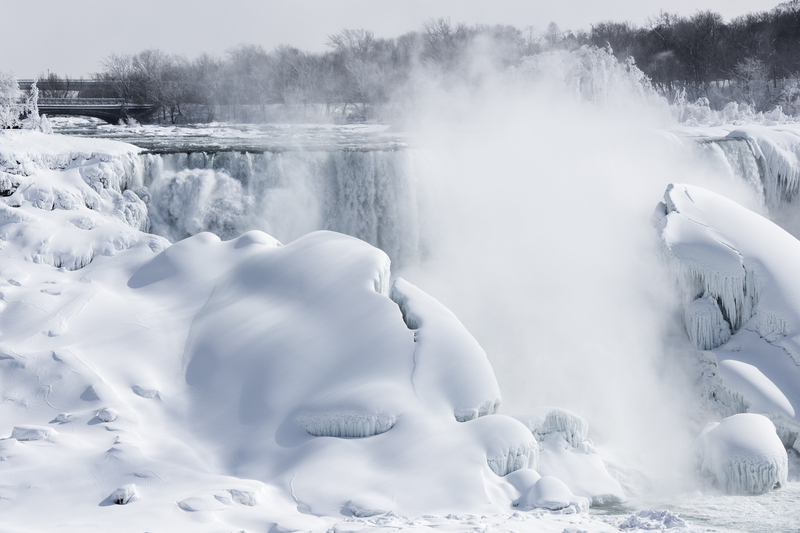 Often in January, during a mild spell followed by a strong southwest wind, ice breaks up and travels down the Niagara River and over the Falls. This wet ice is then forced up out of the water below the Falls where it freezes into a huge mass, taking the appearance of a glacier; with the potential of building up to an incredible height of ten stories! Beginning in the 1880s, it became a popular pastime to gather on the ice for entertainment and to enjoy refreshments served out of outdoor huts set up on the frozen surface. This continued until 1912, when an unfortunate mishap during a particularly mild spell led three people to their deaths, ending the era of public access onto the ice bridge. 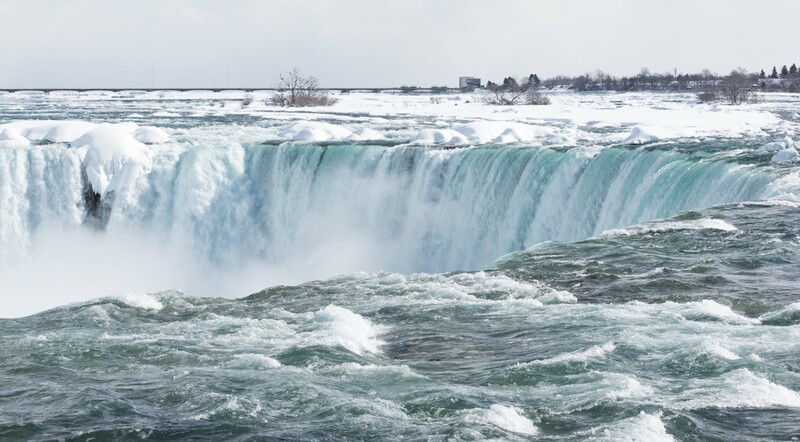 During the wintertime, 75% of the water flowing from Lake Erie along the Niagara River is diverted approximately one kilometre before the Falls through tunnels and canals for hydro-electric purposes and is returned back into the lower Niagara River. 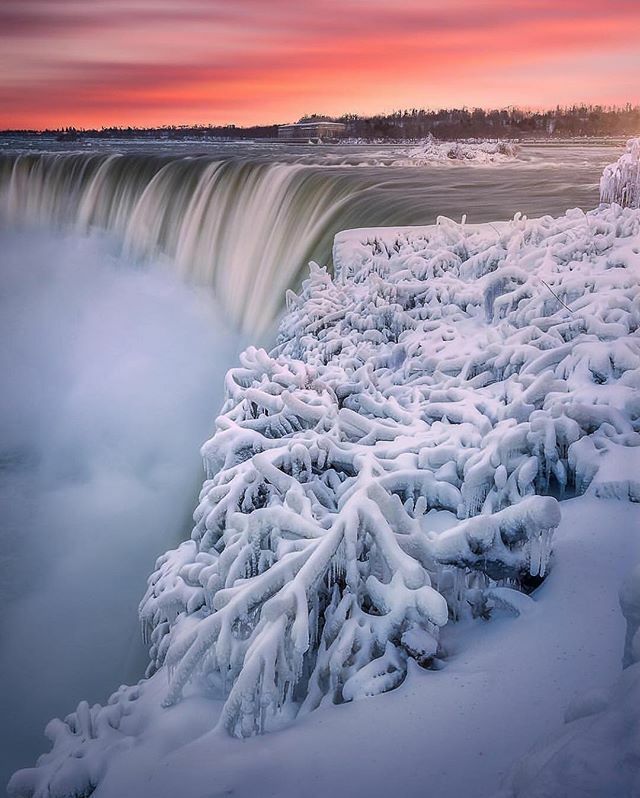 As a result, the “winter flow” or the volume of water that rushes over Niagara Falls throughout the winter months, is approximately 85 million litres every minute. In contrast, from April 1 through to October 31, approximately 50% of the water is diverted, resulting in the summer flow, which is generally measured at 170 million litres of water every minute. Before 1964, ice would float each winter from Lake Erie along the Niagara River, seriously impeding power diversions and damaging shoreline installations and bridges. Beginning in 1964, the use of an “ice boom” at the source of the river has controlled potential damage caused by floating ice. The 2.7 km (1.7 mile) long boom is made of floating 30foot long steel pontoons and is placed between the town of Fort Erie and the city of Buffalo to hold the ice back. 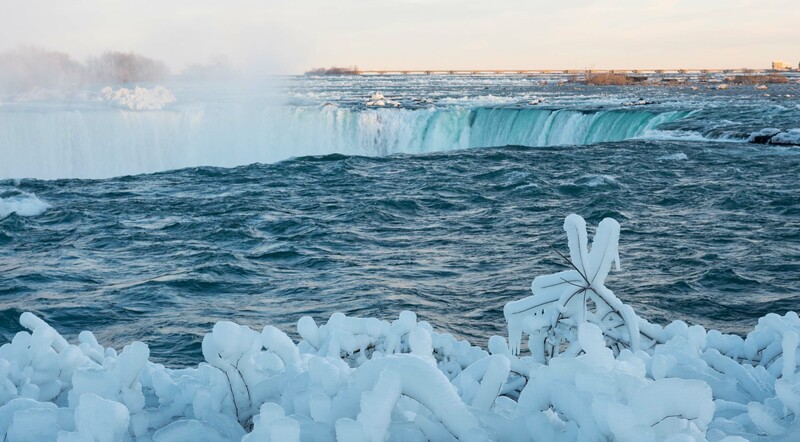 Have you noticed that the American Falls appear to be more “frozen” than the Horseshoe Falls? This is because the American Falls only receive about 7% of the Niagara River flow (with the rest going over the Horseshoe Falls). 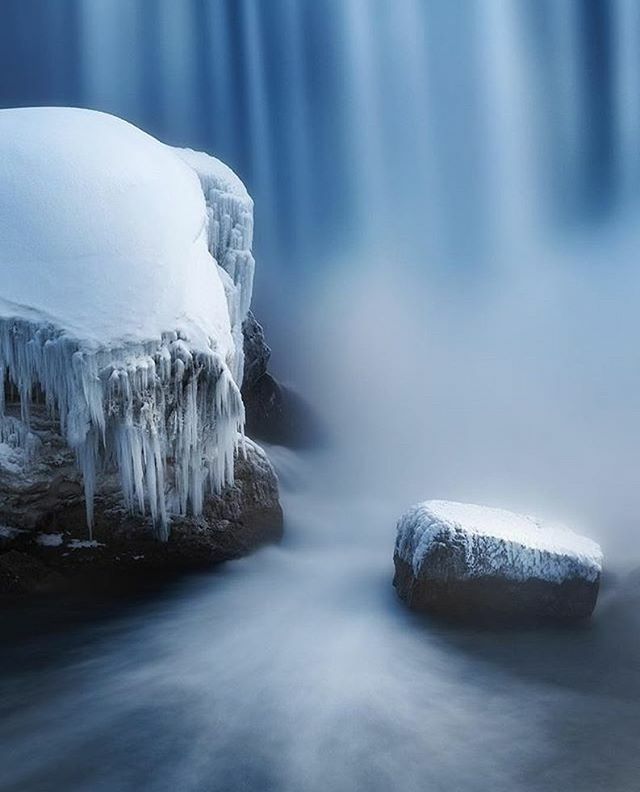 With less water going over the Falls, there is greater opportunity for ice to build up, giving the appearance of “Frozen Falls”. Has the Falls ever stopped? It’s hard to imagine anything could stop the gigantic rush of water over the Falls, yet records show it happened once. For 30 long, silent hours in March 1848, the river ceased its flow. High winds set the ice fields of Lake Erie in motion and millions of tons of ice became lodged at the source of the river, blocking the channel completely. Local inhabitants, accustomed to the sound of the river, heard an eerie silence and those who were brave enough, walked or rode horses over the exposed basin. The self-made dam held the water back until a shift allowed the pent-up weight of water to break through. The annual installation of the ice boom has prevented this from happening since that time. 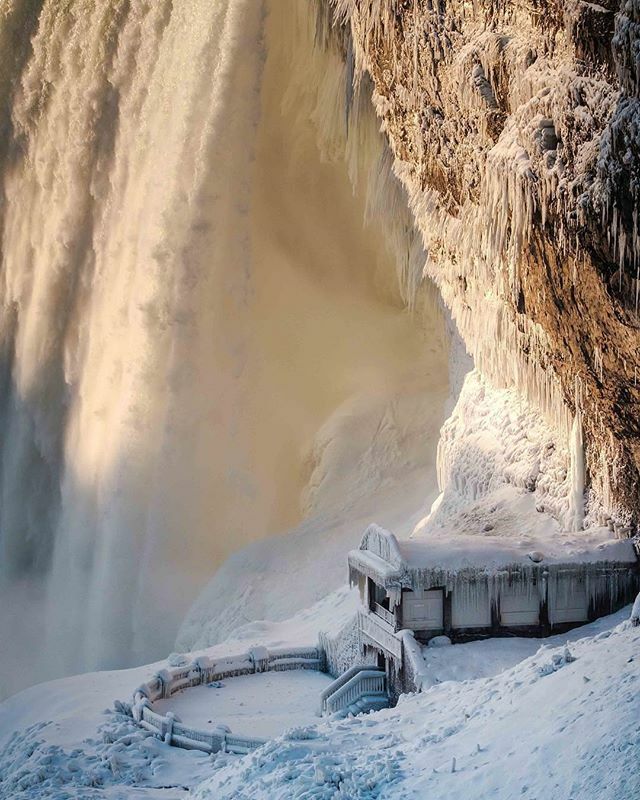 Niagara Falls is a natural wonder that appeals to the visual senses and provides an exhilarating experience, and at no time is this more evident than in the winter. As a fourseason destination, showcasing the natural wonders of the Canadian Niagara River Corridor to the world, from the blooming beauty of spring, the lush greenery of summer, to the vibrant foliage of the fall. 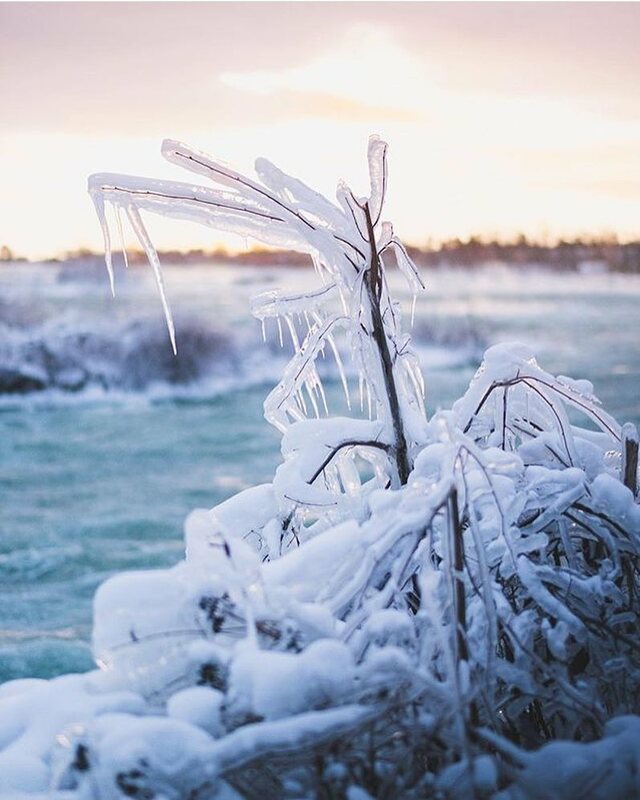 However, in winter, the power of the crushing Niagara River make itself only more prominent, miniature glaciers build in the Niagara Gorge, and the frigid mist coats the surrounding landscape in ice, creating a truly inspiring, natural and magical winter wonderland. Enjoy this seasonal experience with Niagara Parks, either up close at attractions like our Canadian Signature Experience, Journey Behind the Falls, or from the warmth of our Queen Victoria Place Restaurant, directly overlooking the American Falls and featuring a locally sourced FeastON certified menu. From Lake Erie to Lake Ontario, find out why Niagara Parks is a renowned destination for cyclists from around the world. Just because you're short on time doesn't mean you have to be short on adventure. Here is a great way to spend the day in Niagara Parks, including some must-see experiences. Every day after dark, Niagara Falls comes to life with sights, sounds and experiences to last a lifetime. Learn about the history of Table Rock Centre, the iconic building next to the Horseshoe Falls.